“Our immediate goal may be to train people to be medical assistants, but our ultimate aim is to help people achieve their big dreams, no matter what those dreams may be,” said Reena Gadhia, manager of Briya’s Medical Assistant (MA) Program, as she reflected upon the first MA College and Career Panel Briya hosted. During the panel, three speakers presented information about health care career pathways, college admissions, and scholarships, with the goal of helping attendees understand and envision possibilities for their future. The panel’s audience included current students and alumni from Briya’s MA Program, as well as medical assistants from Mary’s Center and additional interested Briya students. The first speaker was Michelle Dorsey, an educational counselor at the College Board, who detailed how her organization helps students access higher education through scholarships and admissions processes. 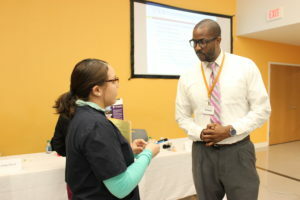 Tiffany Solis, from Trinity Nursing School, and Jason Williams, of the Workforce Development and Lifelong Learning Division at University of District of Columbia, presented on the opportunities offered by their respective institutions. At the end of their presentations, each speaker engaged with the audience for a question-and-answer session. The event concluded with students having one-on-one time with panelists, allowing them to get answers to their specific questions and concerns. “It is a privilege to be standing here tonight with you all celebrating our successes,” Enwet Abebe said, addressing her 19 fellow Medical Assistant Program graduates at a ceremony this December. 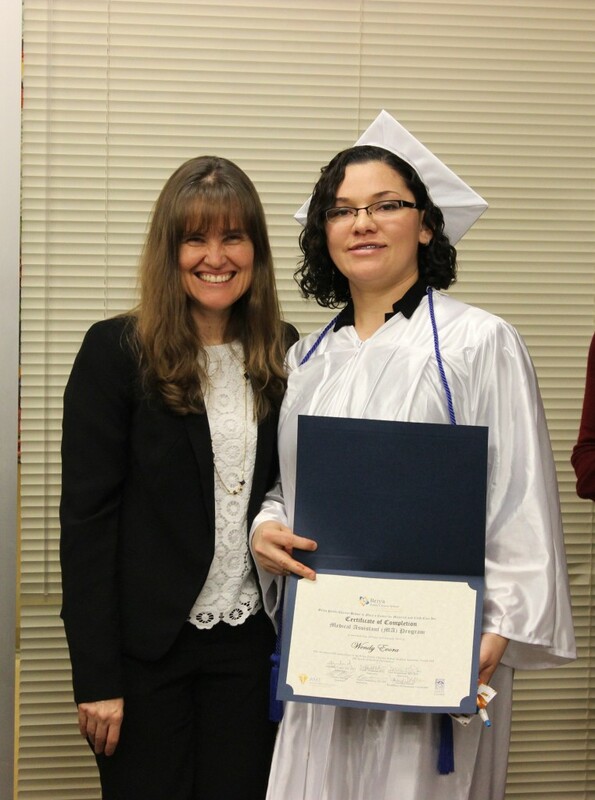 Briya’s program, which was begun in 2013 and is offered in partnership with Mary’s Center, prepares students to pass the nationally recognized medical assistant exam and go on to stable careers in doctor’s offices, clinics, and hospitals. At the time of the graduation, 12 of the 20 graduates, including Abebe, had already been offered jobs as medical assistants. 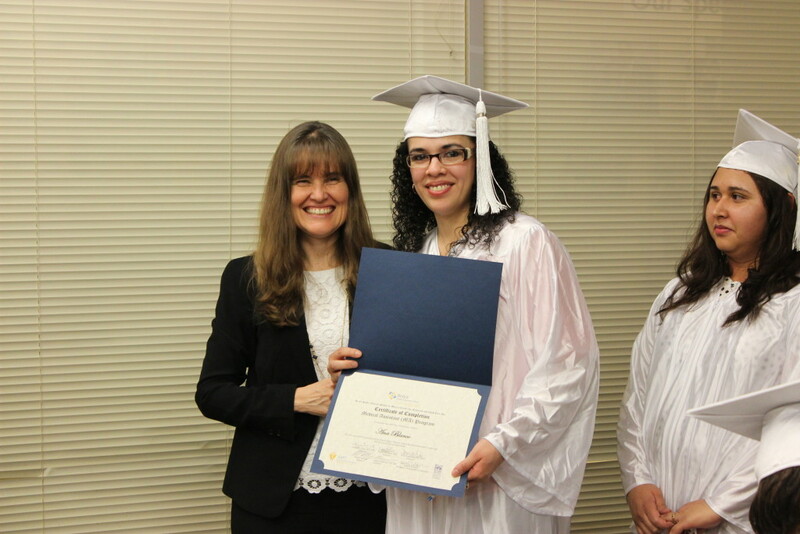 During the ceremony, students were recognized for their outstanding achievements—including those who graduated with high honors and those who had perfect attendance. 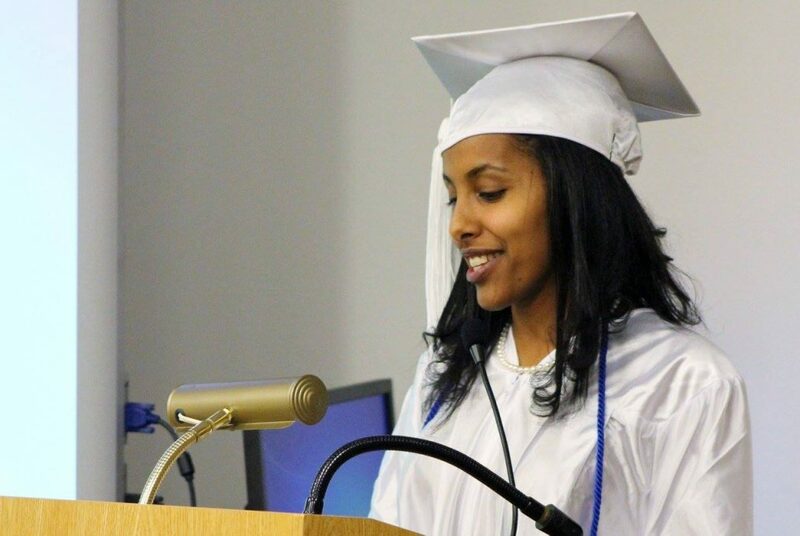 Abebe left her classmates with words of encouragement as she concluded her speech. “It is something I wanted to do and I’m finally doing it. I am helping and making a difference,” Shenell Williams, 2014 Medical Assistant Program graduate, reflected on her MA experience during a celebration on Wednesday, August 23. Proud family and friends gathered together to celebrate the induction of the fifth class of students into Briya’s Medical Assistant Program. Christie McKay, Briya’s Executive Director, welcomed the 28 students and spoke about how proud she is of this program, its students, and its growth. Dara Koppelman, Chief Nursing Officer at Mary’s Center, also addressed guests, sharing how much she values Briya MA students. She announced that Mary’s Center has hired a total of 17 Briya MA graduates. 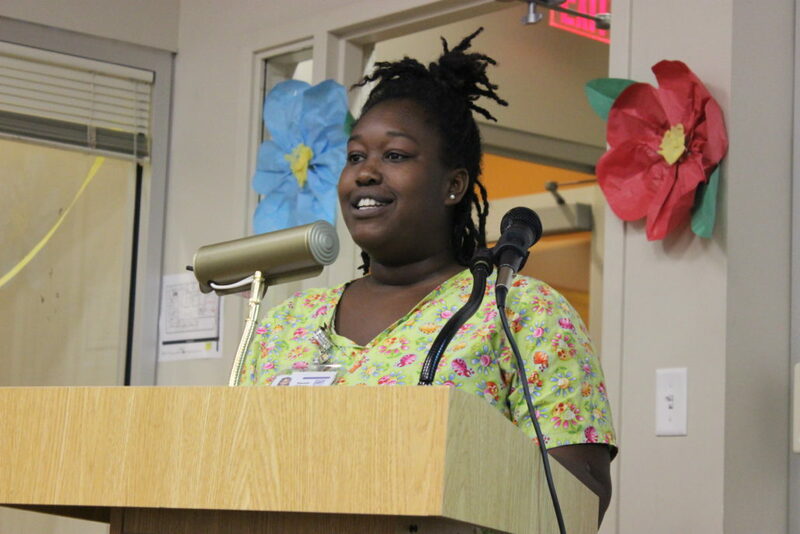 Williams, the first MA from Briya’s program to be hired by Mary’s Center, then enthusiastically addressed the new students and shared her story of her journey through the program. Williams shared that for her, Briya’s MA program provided a second chance, and when she found out she was accepted into the program, “it brought tears to [her] eyes and joy to [her] heart.” She continued to tell students to prepare to work hard, as she often found herself staying late for tutoring. She expressed her gratitude for the staff who supported her every step of the way and happily laughed as she admitted that when she finally took the national Registered Medical Assistant exam, it was much easier than she had expected. After all three speakers, students were then handed certificates of scholarship and received their MA pins. Instructors and former students pinned them on as family and community members cheered in support. In the past three years of Briya’s Medical Assistant program, every student who has taken the nationally recognized exam to become a registered MA has passed. This statistic truly captures the strength of this exceptional program, made possible through Briya’s longstanding partnership with Mary’s Center and the dedication of students and staff. Asmelash was addressing her 18 fellow MA graduates, who were celebrating their accomplishments during ceremony this December. 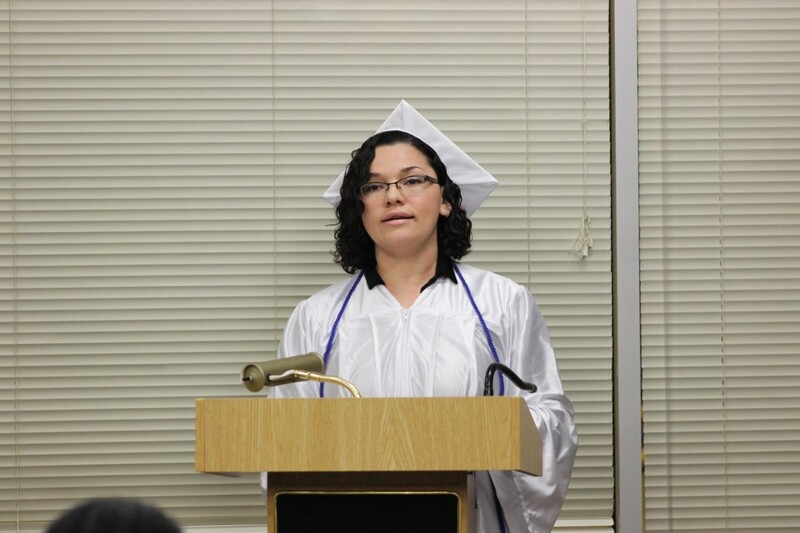 Co-valedictorian Rosa Ramos also spoke at the ceremony. During the ceremony, students were recognized for their accomplishments, including five graduates who already have jobs as medical assistants. In addition, three students were recognized for having perfect attendance–meaning they did not miss a single class period during the entire program. To close her valedictorian speech, Ramos expressed her gratitude to the MA Program staff. Good evening. My name is Lahana Bernard. I am a MA student from this past MA program school year. I would first like to congratulate you all on starting this exciting new journey. I personally feel like this program has definitely changed my life for the better. If I hadn’t found the program, I would be still doing the same rinky dink jobs working at restaurants and coffee shops. I felt like these jobs weren’t stable because my hours were always being cut and I wasn’t paid much. Then I went to an appointment at Mary’s Center and started talking to Shenell who graduated from the MA program. She told me about Briya, so I called to enroll. When I first started the program, it was difficult because I started out with no knowledge. As time went on, I started grasping it and felt like I really knew the information. The instructors here are the best. They are supportive and understanding. They really care and will work with you to make sure you understand the content. The students were passionate about getting the RMA, and the teachers were equally as enthusiastic and encouraging in the classroom celebrating how far everyone has come and excited for our success. Before I heard about the program, I had complications from my pregnancy which inspired me to learn more about health related items. Every day, I googled everything I thought was wrong. I found all of it so interesting. That is where the spark to go into the medical field started. When I first started the program my son was only 6 months old. He wasn’t in daycare which made going to school while being a new mom a little difficult at times. As students, we were all adults and had things going on like children and jobs, but we were all one big family. My classmates took care of my baby like he was their own. We grew attached to each other. Students bonded and supported each other through tough personal and family issues and losses. We even cried together. I will be the first to tell you that there were times when I wanted to quit, but I thought about my son and how far I had already come. The program gave me a light at the end of the tunnel. So my advice to you all is when times are hard and you feel like you’ve hit a wall, don’t give up. Think about why you’re doing the program in the first place and let that be your motivation. This experience helped shape what I want to do. Now, I feel like the medical field is my passion. I have gained a lot of knowledge and skills from this program which will enable me to have a career… not just a job. My dream is to get some hands-on experience for a year before I go back to school in nursing. My ultimate goal is to be a physician’s assistant and due to my experience delivering my son, my area of interest is high risk OBGYN. Now that my year in the MA program is ending, I feel very prepared and confident. On Monday, I am going to take my RMA exam and after that I will be ready to get out there. For you all, the 12-15 months is just starting but it will be over before you know it and you will get to walk away with the title “Registered Medical Assistant” just like me. Thank you all for your time and good luck! 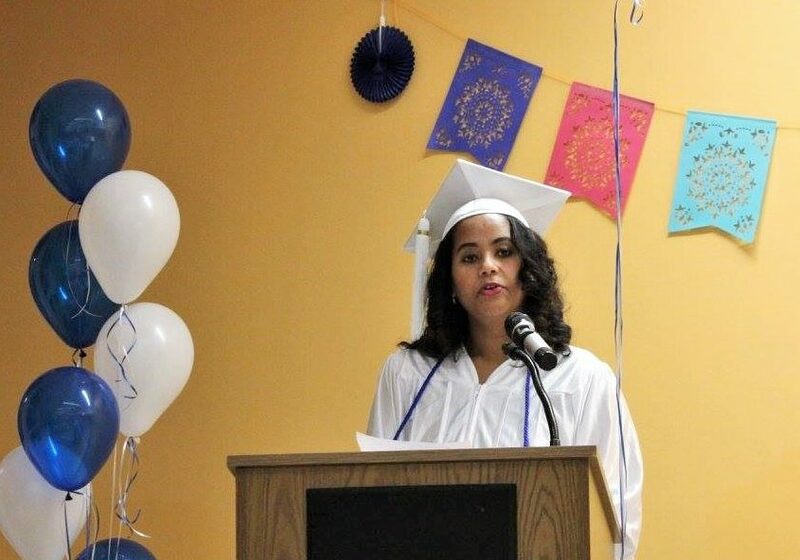 “Reach for the sky and while you are doing so, help as many people as you can,” said Wendy Evora, valedictorian of Briya’s second medical assistant class. 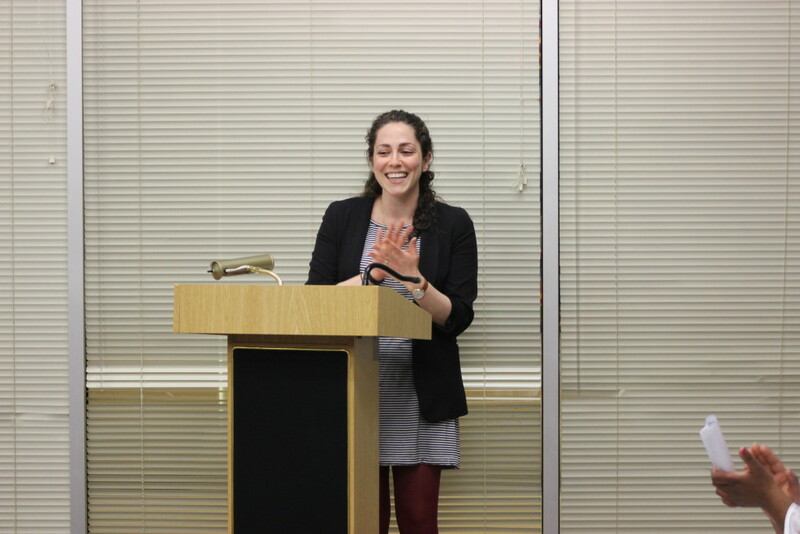 Evora was addressing her eighteen fellow MA graduates, who celebrated their accomplishments during a ceremony this winter. 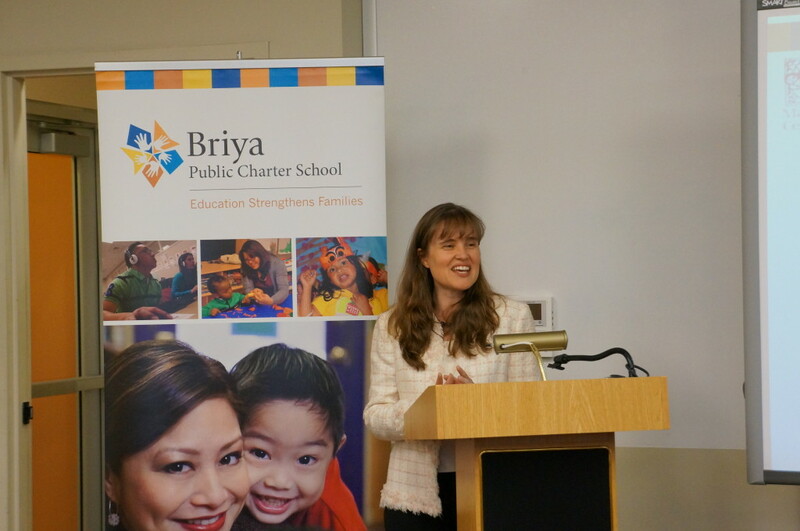 Christie McKay, Executive Director of Briya, welcomed the group and offered congratulations and encouragement. Dara Koppelman, Chief Nursing Officer at Mary’s Center, also spoke to the graduates. During the ceremony, students were recognized for their outstanding achievements. The fourteen graduates who took the national Registered Medical Assistant exam—210 challenging questions in 2 hours—all passed on their first attempt, making them nationally certified medical assistants. The remaining graduates are scheduled to take the exam in the upcoming months. In addition, five students were honored for perfect attendance—they didn’t miss a single class period all year. Six students graduated with honors, finishing the course with a cumulative GPA of over 90%. Six of the students have already been offered jobs as MAs. During her valedictorian speech, Evora stressed the importance of the supportive environment that she experienced as a Briya student. Read Evora’s full speech here. Hello, my name is Wendy Evora. I am glad to be here tonight representing the hard work we have all done in class and in our internships. I would like to say thank you to all of our family and friends for their support. Without you, this day could not be possible. My father once told me, “No one can take knowledge away from you.” I feel so lucky to be one of many people in our multicultural community that Briya, in partnership with Mary’s Center, has given the opportunity to reach the next step in education and job options regardless of our ability to pay. At Briya, I found not just the highest quality of education in ESL, parenting, computers, high school diploma program, and Medical Assistant program, but also a community of people who really care. That is what has kept me working harder and harder because you cannot find that anywhere else. While in the Medical Assistant Program, I learned that as an MA, we are bridges of communication between the providers and the patients. I saw in the internship and practice how the clients really need not just people who can speak their language but also people who can read their expressions and body language to know how to communicate with them and help them. It’s not just explaining the medical terminology—it is about helping patients with their needs. If they don’t have money to pay for their rent, they might not be able to pay for their medicine. Sometimes we get so busy helping patient after patient, it’s hard to remember to be there for each individual person. We need to understand the different needs of each person and have empathy for them in a busy health care environment. We need to get the most out of that communication by finding out a little bit about that person. The provider doesn’t have the time to do that. We are the ones to first meet them and we can get that quality information and show we care. In closing, I am so glad that at school and in the workplace, I have found not just classmates or coworkers but friends who have helped me to serve those who are seeking help. My parents always told me, “Wendy, you must help others without expecting rewards.” This saying so closely matches Briya’s and Mary’s Center’s missions. Before I came to Briya, I was closed in the four walls of my apartment. My manager told me, “The only limit you have is the sky. You can reach and accomplish whatever you want.” I am here to tell you the same thing. Reach for the sky and while you are doing so, help as many people as you can. I would like to say thank you to the MA staff and teachers. Also, a special thank you to Jennifer. You have given us those five minutes of quality time. You have heard us and helped us. Thank you for all you have done. And most importantly, thank you, Briya, for caring. Paulette Sansbury, a student in Briya’s Child Development Associate program and a participant in Mary’s Center, is a shining example of how dedication and care can make a difference in people’s lives. Sansbury cares for infants and toddlers at God Is So Good Child Development Home, which she opened five years ago. Eager to increase her child care knowledge, Sansbury applied to be part of DC’s Early Learning Quality Improvement Network (QIN). Her home was selected and she began working with Mary’s Center, which serves as a training and support center for providers in the QIN. As part of the QIN, Sansbury participates in one-on-one mentoring and monthly trainings, and is enrolled in Briya’s Child Development Associate program. Sansbury’s care and generosity have a big impact on the families she serves. Two of the children who recently began attending Sansbury’s home are 22-month-old twins. Their mother, Kidste Mekonnen, had lost her restaurant business because she didn’t have childcare. Sansbury worked with Mary’s Center staff to help Mekonnen apply for the childcare subsidy that enabled her children to go to Sansbury’s home. Because she now has childcare, Mekonnen is able to attend Briya’s Family Literacy program, where she learns English, digital literacy skills and parenting in the Advanced II class. She hopes to get her high school diploma and get a job again. Mekonnen feels confident and secure leaving her children in Sansbury’s care while she studies. Briya’s Medical Assistant students had a unique opportunity for hands-on learning and collaboration during a recent trip to Georgetown University’s innovative simulation center. At the center, MA students learned from and alongside Georgetown nursing students while acting out various scenarios that could occur in their medical work. With nursing students portraying patients, the future MAs practiced taking vital signs—pulse, blood pressure, respiratory rate and temperature—as they would in a clinic. 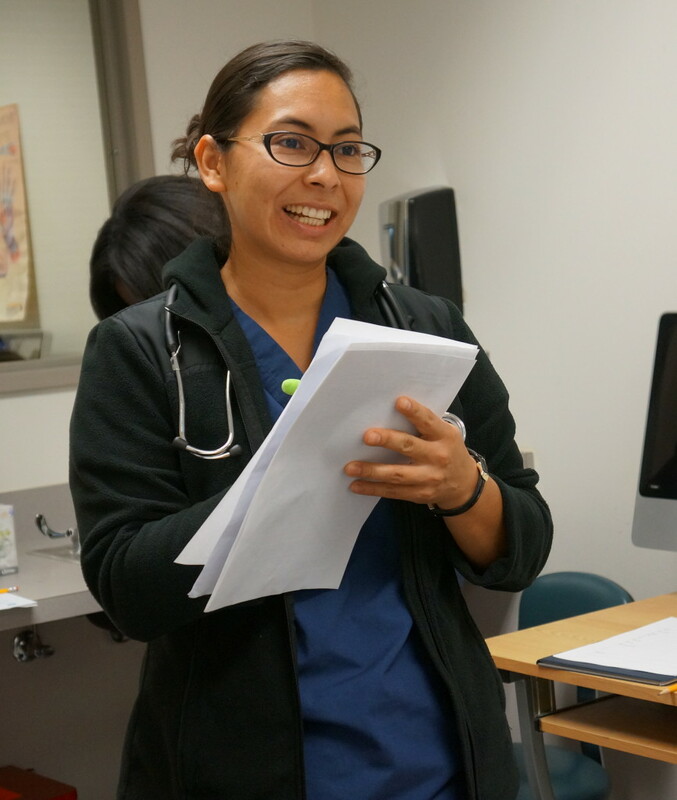 Afterward, the nursing students gave them feedback on what they did well and what they could improve. MA students practiced additional skills, including EKGs, on the center’s robotic patient simulators, which mimic human conditions and responses. In addition to providing valuable practice, the visit gave the students an idea of what their future work setting could be like. “This was a great opportunity for MA students be in a clinic environment and to learn and understand the value of interprofessional collaboration via working with nursing students,” said Reena Gadhia, Lead Medical Assistant Instructor. This was the MA students’ second visit to the center, and they will return later in the year. This was among the advice the incoming class of Briya’s Medical Assistant (MA) Program received from previous students as they were inducted into the program during a ceremony this fall. Briya’s MA program, offered in collaboration with the school’s longtime partner Mary’s Center, runs for 12-15 months and prepares students for a career as a Registered Medical Assistant (RMA). RMAs perform administrative and clinical duties in medical offices, clinics and hospitals. The new MA students were welcomed by Christie McKay, Executive Director of Briya, and Dara Koppelman, Chief Nursing Officer at Mary’s Center. Koppelman praised the work of several MAs from earlier classes of Briya’s program who were since hired at Mary’s Center. She also emphasized the importance of medical assistants as the first and last person patients interact with at their appointments. During the ceremony, new students each received a Medical Assistant pin and a stethoscope. Students from the MA class of 2015 then shared their guidance for the incoming class.